Do you know what these are were for? As I have said before, I am not much of a cook, but my mother was and she used to make donuts with these cutters all the time. My friend Kathy gave me a few of them years ago and they fit my bobbins perfectly. They also make great templates for circles if you need this exact size! Last week Audrey of Quilty Folk posted a photo of her quilting room (here). 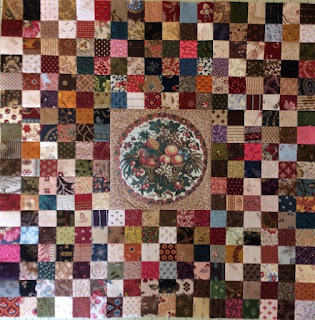 I love to picture where all my blog friends do there quilting. 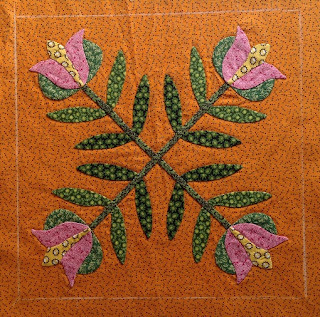 Cynthia of Wabi-Sabi quilts posted her photos (here). I am green for those yellow walls! 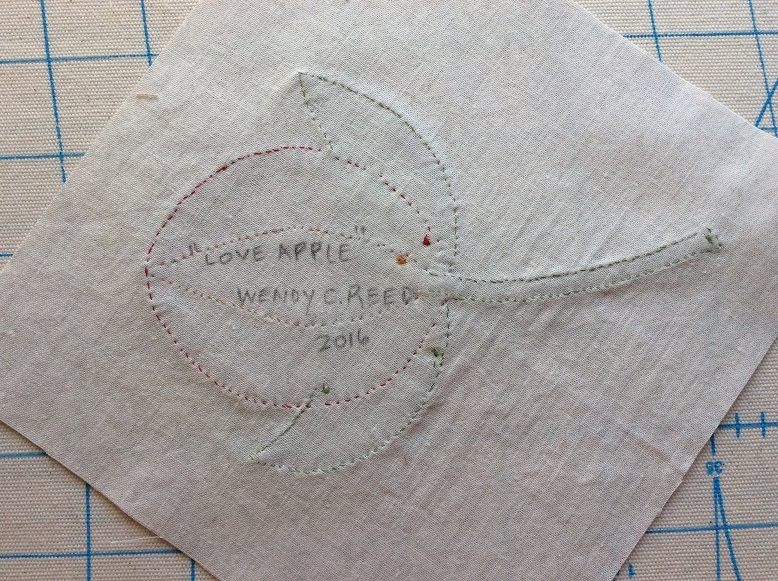 And Karen of Selvedge Blog posted her studio photos (here). Look at that space!! I have posted photos a few times but most recently after the Christmas clutter phase (here). So, can we see your space? I like to know where you all perform your quilting magic! Enjoy the day. Today’s Quilty 365 circle marks my 100th block. I am a great “starter” of projects, but rarely do I stick with something for this long. I am what my friend calls a “creative flea”, jumping from one thing to another so thanks Audrey for giving me the initiative to keep going. Only 265 more! I have a funny weather story as I know a lot of us have been in the deep freeze these past few days. I took Thursday and Friday off with my friend to visit her cousin in southern NH. We had a blast! When we returned to the house and turned on the news, (she gets the local Boston stations) I was amazed at how they focused so much attention on the weather. It seemed the main focus of the news was the “dangerously cold” temperatures and that you should remain inside if possible. I don’t watch the weather very often so when I got home I decided to see what our local stations were saying. Yup, just as I thought, they were saying “it’ll be pretty cold today so be sure to dress appropriately when you are out on the trails”! It was 11 below zero at my house this morning. I love living in Maine! That being said, I took the Boston station’s warning this weekend and stayed inside to quilt! 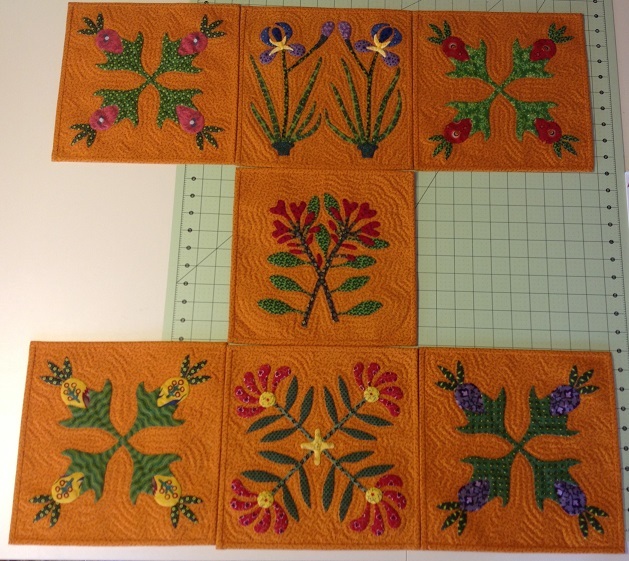 One of our quilt guild’s co-president’s asked us to make a 6” block. She didn’t say why, simply make your favorite 6” block and write the name of it and our name on the back. 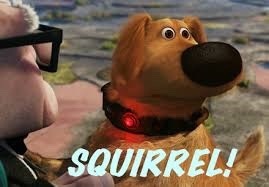 This is mine. I love the “Love Apple” block. So simply and pretty. I also washed and pressed all the goodies my friend and I bought at the fabric store. And “finally” started the reproduction quilt for an exhibition at our state show this summer. More on that later. Gotta run! 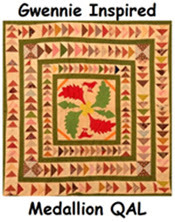 Have a super quilty day. 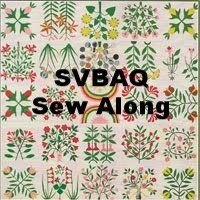 Month 5 in the ShenandoahValley Botanical Album Quilt (do you see why we shorten it to SVBAQ!) 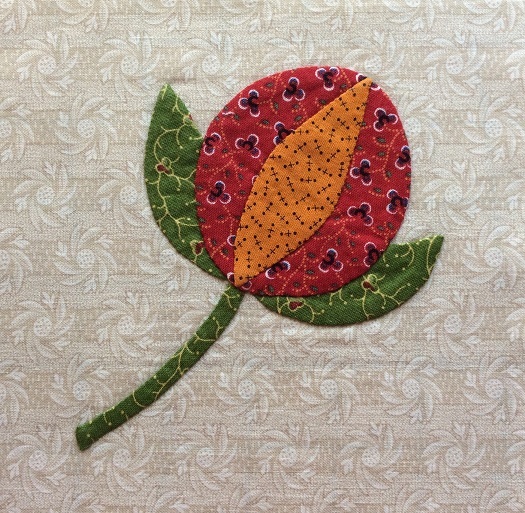 sew-a-long is the Yellow/Pink Tulip. I surprised myself by finishing it early this time (but I think I should have pressed it before I took the photo!). Well, I guess I surprise myself every month when I realize I am still keeping up with this. This is my 8th block (I made 4 of the first month’s Pineapple block for the 4 corners). I now have the first 7 hand quilted and bound. I switched up my block arrangement a bit from the original. It will be a while before I can start stitching them together as they are introducing the blocks randomly, which is actually a lot of fun. Maybe I'll just leave them in a pile for a while! I like to see what Doreen and Dawn will come with for the next blocks. Do head over to the blog (here) to see all the wonderful blocks. They are on Facebook as well. I actually got quite a bit accomplished this weekend, but nothing photo worthy. I made up 75 kits for my upcoming “potholder quilt” classes. That took all day Saturday and of course while searching for scraps to make up the kits I decided to clean out two huge scrap baskets. I see a scrap giveaway coming soon! I should have photographed the empty baskets. I’ve been doing a lot of hand work lately. In fact, I’ve been away from my machine so much in the past few months, I thought I just might have forgotten how to use it. 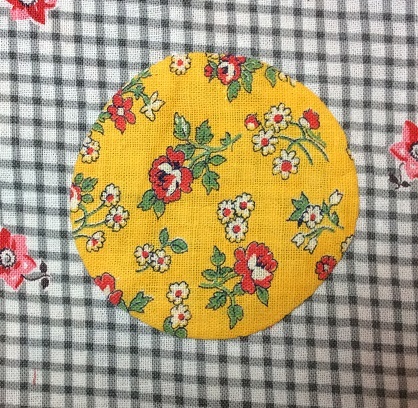 But, I guess it is like riding a bike (although I was much better on horseback) as I sat right down and pieced this little medallion top. Thanks to my friend Cyndi (Busy Thimble), there are 288 different fabrics in this little top. They finish 1". 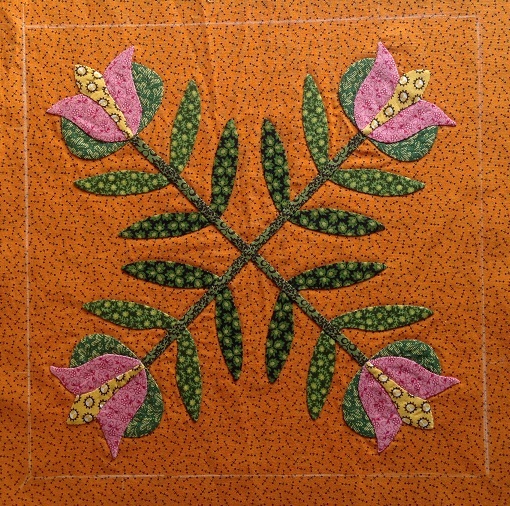 The center is from a reproduction panel that Kay Triplett printed from one of the quilts in the Poos collection. This is the 6" size but it wasn't exactly 6" so I had to applique it onto a background for it to fit. I believe they are still available on Etsy. I’ve finished the final step in Randy’s bullseye blocks as well. Now to just put them together! Hope you get a little stitching in your day too! …keeps the blues away! I just love getting up each morning and stitching my little Quilty 365 circle. I stitched #85 this morning! Here are last month’s circles. And, here is a shot of 4 rows all stitched together and rolled up on paper towel rolls. And just look at all those little circles from cutting out the back of each one. I see another project in the making! I have also made progress on Randy’s bullseye sew-a-long. This has been a great learning experience for me. It is rather "liberating". I'm not saying that I am a precision piecer, but it has been hard to be so "free" with my seams.